Comparative genome content analyses provide insight into the early evolution of animals. A novel method that permits the use of larger datasets in such studies yields results that are consistent with classical views of animal phylogeny. Reconstruction of the phylogeny of animals sheds light on unanswered questions in evolutionary biology, including the origin and development of tissues and organ systems, such as muscles and nerves. However, tracing the deep phylogenetic relationships of animals remains a challenging task. Nowadays, this endeavor is based largely on the comparative analysis of amino-acid sequences of proteins. This approach can now be applied to ‘phylogenomic’ datasets encompassing virtually the complete protein sequences of an animal's genome. In spite of these advances, however, we still do not have a generally accepted phylogenetic tree of animals. This is especially true at the root of all animals, whose early evolutionary history remains highly controversial. Now researchers led by Professor Gert Wörheide (affiliated with both the Department of Earth and Environmental Sciences, and the GeoBio Center at LMU Munich), Dr. Walker Pett (Iowa State University, USA), and Professor Davide Pisani (University of Bristol, UK) have introduced a new methodological approach, which avoids the difficulties of sequence-based data analysis, and corroborates the classical view of animal phylogeny. The findings appear in the journal Molecular Biology and Evolution. To untangle the relationships among early-evolving animal groups, evolutionary biologists compare the sequences of ‘homologous’ genes from a range of species. Homologous genes have similar amino-acid sequences and code for proteins that often perform the same functions in the different species of interest and are therefore assumed to have been derived from a common ancestor. As a rule, these analyses have specifically focused on ‘orthologs’, one of two recognized subgroups of homologous genes. Orthologs are genes which are thought to be derived directly (by vertical descent) from a single ancestral sequence. “But genes evolve at different rates, and in the case of lineages that have undergone rapid diversification – those in which the rate of accumulation of novel mutations is especially high – genes can change so fast that it becomes very difficult to confidently identify genes that are true orthologs,” says Wörheide. This phenomenon diminishes the amount of data that can be used for sequence-based phylogenetic analyses, and may reduce the statistical significance of the results. To avoid these drawbacks, Wörheide and his colleagues have adopted a different strategy, in which the presence or absence of homologous gene families (i.e. gene content) rather than the comparison of orthologous gene sequences is the data of interest. This shift of viewpoint enables them to take what are called ‘paralogous’ homologs into account, in addition to the orthologs mentioned above. Paralogous genes are products of the duplication of a pre-existing gene, which subsequently may evolve independently of each other. “When all homologous gene families, rather than orthologous genes alone, are incorporated into a comparative phylogenetic analysis of gene content, we have a much deeper store of information to draw upon,” explains Walker Pett, first author of the new study. To test the resolution of the method, Pett and colleagues investigated the phylogeny of the earliest-branching lineages in the animal tree of life, using either the complete set of identifiable homologous gene families or the subset of orthologs. Of particular interest among these animal phyla are the sponges (Porifera) and the comb jellies (Ctenophora), as it remains unclear which of these groups represents the sister group to all other animals. 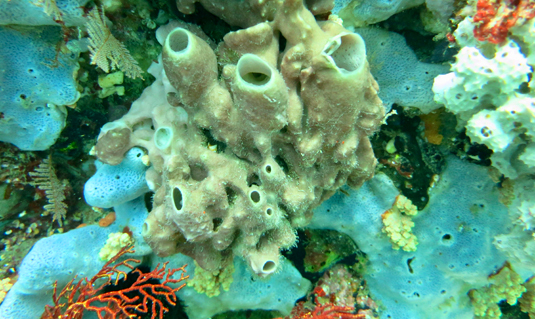 “Irrespective of whether we include paralogs or not, our results are consistent with the classical view of animal phylogeny in that the sponges are the sister group to all other extant animal lineages,” says Wörheide. Analysis of the ortholog gene content on its own places the comb jellies as the sister group of Placozoa, Cnidaria and Bilateria (this last group accounts for 95% of extant animal species). Including homologous gene family content data, however, identifies ctenophores as the sister group of the Cnidaria. This result agrees with a proposal drawn from morphological studies – the Coelenterata hypothesis – that dates back to the mid-19th century, a view which had gone out of favor in recent years.